It’s been more than three months since my last blog post so you might be wondering: What happened to Spencer? Well, the short answer is I’ve been working hard at my new day job as Deputy Bureau Chief of The Wall Street Journal, which takes up most of my working hours. Given how busy I am at WSJ I have decided to take a temporary hiatus from regularly blogging on Creative Capital. That may change in the future but for now if you want to keep up with my work please subscribe to my Twitter feed where I post links to many if not all of my WSJ stories. Thanks to everyone for coming by to read this blog. I started it back in 2008 to help launch my book, and then it evolved into a publishing vehicle for a broader set of stories related to the book and my work as a technology and finance journalist. I am not sure how it will evolve going forward but I am grateful to everyone who dropped by and contributed to the conversation. Onward …. One door closes and another opens. What’s really neat is when the transition happens quickly and smoothly. And so …. I am thrilled to announce that I will be joining the Wall Street Journal as Deputy Bureau Chief of its New York Corporate Bureau, starting April 12. Keith Kelly of the New York Post wrote up an item about my new gig in today’s Media Ink column. This is a new bureau that was formed this January to oversee reportage of big companies such as General Electric, IBM, Procter & Gamble, and several big beats, including telecommunications, New York retail and fashion, and recruiting and management. “We formed the New York corporate group to focus on the importance and raise the visibility of the main corporate beats that the Journal covers. This group will also help to strengthen the cooperation between Newswires and Journal reporters,” said Robert Thomson, editor-in-chief of Dow Jones & Company and managing editor of The Wall Street Journal, announcing the formation of the bureau. I loved working at BusinessWeek for the last decade. And now I am stoked to join the Wall Street Journal at this unique time. Under New Corp., there’s a lot of energy and excitement pulsing through the newsroom as the Journal pursues an ambitious expansion. I hope to play one small part in making a great place even greater. Onward . . .
Wall Street Journal columnist Gordon Crovitz wrote a great column on Monday with the biting title “Intelligence Is a Terrible Thing to Waste” criticizing the Obama Administration’s policy of treating terrorism as a law enforcement issue. I’ve mostly been a supporter of this approach but Crovitz got me thinking hard about the limitations of such a strategy. One problem he highlights is that our legalistic approach is harming our ability to thwart terrorist plots because we are giving foreign nationals Fourth Amendment protection against unreasonable searches. U.S. intelligence agencies are using this standard when deciding if and when to put suspected terrorists on a watch list or a no-fly list. While I agree that U.S. citizens should be afforded these rights, it seems foolish to give suspected terrorists these same privileges. Clearly, we need to have a more flexible standard for determining whether or not suspected terrorists, who often live outside the U.S., deserve to be placed on any of these government security lists. The Good: A fascinating account of how John Paulson profited big time from the housing meltdown. The Bad: A times the narrative seems a tad scattered and gossipy. The Bottom Line: A dramatic and plausible account of one man’s triumph. The Great Recession of 2009 destroyed trillions in wealth. But a few lucky or shrewd souls profited from this catastrophe. Perhaps the single largest beneficiary was John Paulson, a hedge fund manager who engineered the greatest trade in history, earning his firm $20 billion by betting against the housing market. In 2007, Paulson took home a staggering $4 billion for himself, the largest one-year payout in the annals of finance. That’s more than $10 million a day, if you’re counting. How Paulson and a handful of contrarian investors pulled off this once-in-a-lifetime coup is the subject of The Greatest Trade Ever by Gregory Zuckerman, a senior writer at the The Wall Street Journal. Paulson has released a statement calling the book a disappointment filled with inaccuracies, which he didn’t specify. But The Greatest Trade Ever comes off as a fascinating and believable counter-narrative to the growing pile of books recounting the disastrous mistakes made by many of the supposedly smartest minds on Wall Street. It is also a surprisingly dramatic work—although not always in an enjoyable way. It is the drama of waiting to see the horrific destruction scene in an apocalyptic movie. The latest news out of Sun Valley, reported by the Wall Street journal’s Julia Angwin, is that Google CEO Eric Schmidt was cool to the idea of building its Chrome Web browser. Schmidt, a veteran of several wars with Microsoft, resisted the project for six years before a demo of the browser changed his mind. This minor revelation says a lot about Google, I believe, and reflects a new more healthy attitude towards Microsoft–and perhaps a sign of maturity for Silicon Valley. Ever since Microsoft took over the market for PC operating systems and business software, Silicon Valley companies have generally assumed one of two positions towards Microsoft: abject fear (as evidenced by any startup) or loathsome obsession with taking it down (best embodied by Sun Microsystems’s former CEO Scott McNealy). Schmidt’s position on Chrome reflects a new attitude toward the Redmond giant that I would characterize as healthy respect. Schmidt did not want to rush into a fight with Microsoft over the browser because he knew, having lost many battles with Microsoft as an executive at Sun and Novell, that it was an unwise and potentially distracting move for the company. Since then, Google has gotten much much bigger and much more powerful. The Chrome project, both the browser and the operating system, has evolved to a point where it was good enough to fight for consumer’s attention in the marketplace. And Microsoft, though it remains arguably the most powerful tech company in terms of its financial heft, is no longer the pole star around which the entire technology universe revolves. Even so, Schmidt is still wide enough to not pull a McNealy and stick a finger in Microsoft’s eye, antagonizing the giant and attracting more attention from regulators poking around its business. Schmidt and Google cofounder Page, says Angwin, were careful not to position Chrome as a competitor to Microsoft Windows. They argued that Chrome will expand the market for netbooks, rather than eating into Windows’ share of the netbook market. I doubt they really believe that. But it’s a much smarter move to play down expectations of this effort. All I can say is: booyeah!!!!!!!! I never thought that it would make any sense to cover the dot com bust in this book, which basically ends in 1980s with the death of Doriot and the rise of Silicon Valley. 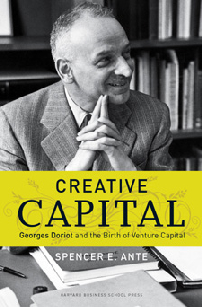 Plus, if you understand Doriot, you know that he would be very critical of the dot com boom. Back in the 1960s during America’s first love affair with high-flying technology stocks, Doriot railed against short-term oriented investors–he called them speculators actually–for inflating the prices of stocks beyond any rational expectation. He joked that investors had traded price-to-earnings ratios for price-to-hope ratios. His philosophy was to build companies for the long haul, not flip them for a quick profit–the antithesis of the dot com boom mentality. So even though I don’t directly address the dot com bust, I think my analysis of that period is embedded in the book. Still, when the paperback version of the book comes out, maybe I will add a postscript analyzing the dot com bust from the perspective of Doriot. So instead of launching a proxy fight after passing its self-imposed deadline, Microsoft did the smart thing and tried to show Yahoo some love, so says the latest leak-story in the Wall Street Journal. My bet: There’s no way Microsoft is going to push its bid into the high 30s. This deal gets done at $34 or $35, just as I have said all along. That allows Microsoft to save some face, and Yahoo to feel like it didn’t roll over. Yahoo’s quarter was good enough, and the prospect of a drawn-out proxy battle is so unappealing, that Steve Ballmer is likely to bump up his offer just a tad more to close the deal. Yahoo needs to get the deal done because if it doesn’t, its stock would plummet, drawing a raft of distracting shareholder lawsuits. In the last two days, the Wall Street Journal and the New York Times have both run front page stories about Austin’s South by Southwest Festival, known as “Southby” to festival aficianados. The Journal story reported on the rising influence of corporations at the music part of the festival–and the consequential crackdown by festival organizers on private, invite-only corporate parties that violate the open access ethos of SXSW. I have not had the pleasure of attending the music part of Southyby. I barely survived three days at the non-stop Interactive segment. But I have to say that I was pleasantly surprised to find hardly any sign of corporate influence at SXSW Interactive. Heck, Facebook was the biggest show in town and their CEO is known to wear flip flops and T-Shirts to the office. Southby is sort of like the anti-CES. It’s not about being overwhelmed by a blizzard of press releases and product announcements or marketing shlock. It’s about the conversation, about exchanging ideas and inspiration with like-minded creative folks down in the trenches. Think TED with an indie bent. While I was in Austin for three days, I played a game to prove this point: I called it the find-the-man-in-the-suit-and-tie game. Before I arrived, I had heard complaints about the growing role of “suits” at SXSW. So for three days I searched for someone wearing a suit and tie. I found not one. I didn’t even find one single soul sporting a suit, let alone a tie. Instead, I saw an endless stream of cool young people dressed in jeans, T-Shirts, dress shirts and hoodies, with the occassional rebel donning a sport jacket. Confession: I actually brought a suit to Austin (no tie though). Since I was giving the debut reading of my book and I had never been to the festival before, I decided to play it safe and bring one. Roaming the convention center, I quickly realized, it was as if I had brought a bathing suit to Alaska. The suit never saw the light of day. I ended up wearing the Southby uniform–jeans and a long-sleeve shirt. The reading went pretty well, though I made a few mistakes. The biggest? I chose too many stories to read, didn’t pick all of the right ones, and underestimated the time it would take to read them. The result was that I raced through the end of the talk and left no time for Q&A. Doh! Next reading I will pare down the number of stories and tailor their selection more tightly to the audience. Another cool part of SXSW was that Barnes & Noble set up a portable book store in the trade show area of the conference. Here’s a photo of my book for sale. I feel proud to be sandwiched between best-selling authors Bill McKibben and Timothy Ferriss. I hope their pixie dust rubs off on me.